Darien's Alex Ostberg, right, and Armstrong Noonan, left, of Darien. The Darien distance medley team of Armstrong Noonan, Carter Ashcraft, Arthur Cassidy and Alex Ostberg placed second in the New Balance Indoor National Championship on Friday with a time of 10:05.47 to earn All-American honors. "This was redemption for us," said Tyson Kaczmarek, Head Coach. "Alex missed this meet last year due to illness. To come back and start of the meet with this performance was very gratifying." Noonan took the lead in the last 400 meters of the opening 1200 meter leg where he split a time of 3:06.53. Ashcraft followed with a season best of 52.74 to keep Darien right in the mix. Cassidy ran 1:59.40 and handed off the baton in fourth place. Ostberg was out fast, but stayed well under control to bring the team right to the front of the race before splitting 4:06.80 for 1600 meters. "You know, I don't pay attention much to what is written, but when I read the preview of the race and it did not mention us, I took it personally. But, when you underestimate our program, we make you pay," said Kaczmarek. Ostberg's split of 4:06.80 was the second fastest split among all of the anchors. The total time of 10:05.47 broke the DHS school record 10:43.45 set by Douglas Wright, Logan Hohs, Kevin Sousa and Artem Skobrev in 2008. In addition, it broke the FCIAC and state record set by Staples in 2013 of 10:07.01. "Anytime you break a record set by Henry Wynne of Staples you have to have run fast. He dominated Connecticut track for two years and was a two-time National Champion in the one mile. One of the most impressive runners I have ever seen." Noonan felt the team performed well. "Coming off of a second place finish in the same race last year (outdoor) I knew that we would be eager to have a shot at first. I thought that we did everything possible as a team to place as well as we did though, and I know that all of us left it all out on the track to reach the goals we had set for ourselves this season. It was an incredibly close race all the way to the finish line and the fact that we came in second by such a slim margin only makes us hungrier for a national title this spring. As such a close group, we're determined to train our hearts out to make it happen. Overall though I feel honored to call these guys my teammates. At the end of the day few teams can say that they can produce such incredible athletes that are also the best of friends. Being All-American only makes it that much better." Ostberg had a similar feeling: "The level of excitement around the DMR was incredible. There was certainly a lot of anticipation and pressure but in order to control that we split the race into individual segments with personal goals. Army, Carter, and Arthur all executed their own tactical plan to perfection which contributed to a fantastic time and result overall. When I got the baton the adrenaline and the energy from the crowd almost carried me around the track. I was honored to anchor the relay and represent our program." Finally, the time of 10:05.47 ranks number two in the country during the indoor season this year and Number 12 in the United States all-time. "We are so proud of the kids. They ran their hearts out. It was amazing. The team that beat us is a quality program. They won outdoors last year and their anchor is one of the top 1600 runners in the country." Noonan, Ashcraft and Cassidy each earned their second All-American honor. Last year they were part of the same Distance Medley team outdoors that placed second at Nationals. 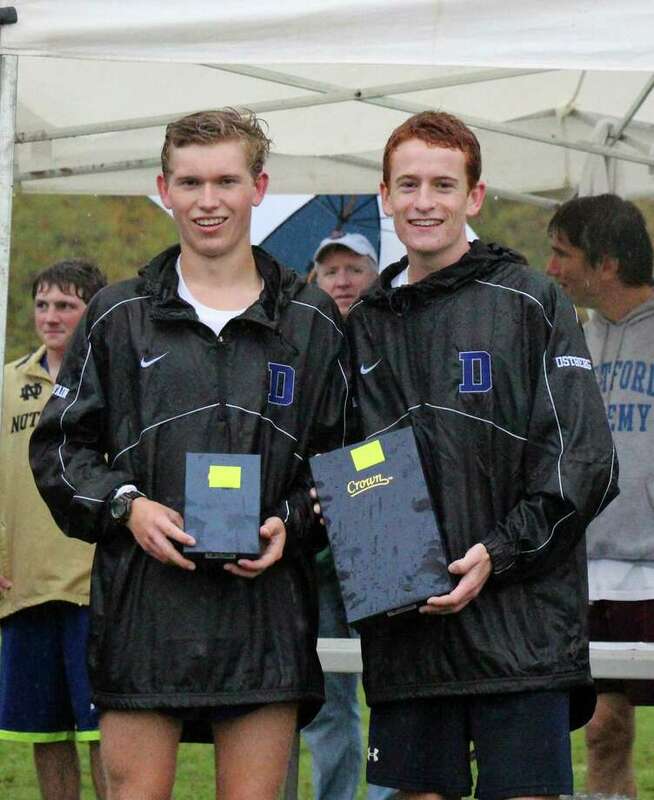 On Sunday, Ostberg and Noonan returned to the track to compete in the two mile. Entering the meet, both athletes had posted top-10 times in the country indoors this season in the event. A fast pace early on was set by the field. Ostberg opened the first 1600 in 4:21 and Noonan was under 4:30. Ostberg and a pack of two other runners broke away from the field at this point. After jockeying back and forth for the lead, the sprint was on in the final 400 meters. Ostberg closed in 60 seconds, finishing in third with a time of 8:48.88. His mark broke the DHS school record and FCIAC record he set at New Englands two weeks ago of 9:00.58. In addition, the time sets a state record, breaking the previous mark of 9:00.29 set by Christian Alvarado of Fairfield Prep. Ostberg becomes the first person in Connecticut to break 8:50 for either 3200 meters or 2 miles indoors or outdoors. His performance ranks #3 in the United States this year and #8 in the United States All-Time Indoors. "I'm speechless. That was an absolutely incredible performance. Alex went to a level he has never gone to before. In the spring, he will run even faster." Ostberg was pleased with the performance and seven second personal best: "Going into the race I had intentions of running a fast time. But to finish with an 8:48 greatly exceeded my own goals. Lowering my own personal best by such a large margin gets me really excited about the possibility of running even faster in the outdoor season with a few more months of training under my belt. Although I came up just shy from winning it, I have to be thankful for the competition which aided me in running the time I did. Noonan placed 15th in 9:16.80. "Army is so tough. That pace early on was blistering; it sucked the life out of some of the guys and made it hard for them to close." Ostberg is now a six-time All-American. The state records are Ostberg's fourth and fifth as he also holds the outdoor state record in the 3000, 3200 and 5000.